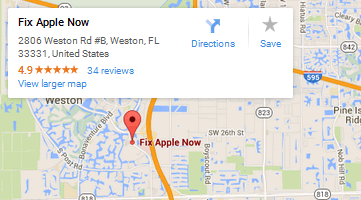 Below you can find driving directions from Google Maps to help you get from Marathon to your nearest Fix Apple Now store, situated in Weston. You can either copy the driving instructions below or click here for a larger map and driving directions. Do you need to fix your iPhone 4, 5 or 6, iPad, iPad Mini, iPod, Mac Mini, Apple Mac, MacBook Pro or MacBook Air in Marathon? Keen to save cash without compromising on quality? If so, choose Fix Apple Now. At Fix Apple Now, we specialise in providing high-quality repairs for a host of Apple devices, so why not talk to us today if you need to mend, repair, replace, fix or reset your machine? Our engineers have been in the business for many years and are here to return your device to its former glory. Some of the most common problems we solve include crashing apps, devices not switching on, boot loop, cracked and frozen screens, crackling audio through headphones and various other issues. You can count on us to fix your problem quickly so you don't have to be without your device for longer than is necessary. Talk to us today to find out more about the various Apple repair services we offer. Follow U.S. 1 S and Ronald Reagan Turnpike to FL-818 W/Griffin Rd in Davie.